We have recently added the Reigl VZ1000 terrestrial laser scanner into our survey and mapping toolbox. This is with the objective of providing our clients with a more effective tool as well as to provide a wider selection of survey and mapping solutions for a diverse set of circumstances and applications of our customers. The V-Line 3D Terrestrial Laser Scanners RIEGL VZ-1000 provide high speed, non-contact data acquisition for ranges up to 1400 m using a narrow infrared laser beam and a fast scanning mechanism. High-accuracy laser ranging is based upon RIEGL's unique echo digitization and online waveform processing, which allows achieving superior measurement capability even under adverse atmospheric conditions and the evaluation of multiple target echoes..
6. Urban development, city modeling and virtual reality creation etc. 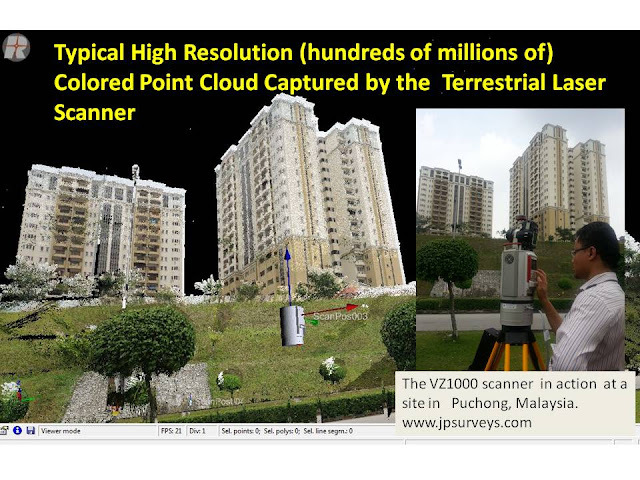 Deliverables can be in the form of point clouds, CAD file, cross section/profile, topo/structure plan etc. Obtain the flyer here , data sheet here or contact us for more information.